The Sycamore Gap Tree or Robin Hood Tree is a sycamore tree standing next to Hadrian's Wall near Crag Lough in Northumberland, England. It is located in a dramatic dip in the landscape and is a popular photographic subject, described as one of the most photographed trees in the country. It derives its alternative name from featuring in a prominent scene in the 1991 film Robin Hood: Prince of Thieves . The tree won the 2016 England Tree of the Year award. Crag Lough is an inland lake at the southern edge of Northumberland National Park, 2.5 miles (4.0 km) north of Bardon Mill, and 0.5 miles (0.8 km) north of the B6318 Military Road in Northumberland, northern England. At this point Hadrian's Wall is at the top of a line of crags with Crag Lough at the foot of the crags. Milecastle 39 is a milecastle on Hadrian's Wall. Housesteads Roman Fort is the remains of an auxiliary fort on Hadrian's Wall. Its ruins are at Housesteads in the civil parish of Bardon Mill in Northumberland, England, south of Broomlee Lough. The fort was built in stone around AD 124, soon after the construction of the wall began in AD 122 when the area was part of the Roman province of Britannia. Its name has been variously given as Vercovicium, Borcovicus, Borcovicium, and Velurtion. The name of the 18th-century farmhouse of Housesteads gives the modern name. The site is owned by the National Trust and is in the care of English Heritage. Finds can be seen in the site museum, in the museum at Chesters, and in the Great North Museum: Hancock in Newcastle upon Tyne. Robin Hood: Prince of Thieves is a 1991 American romantic action adventure film, based on the English folk tale of Robin Hood which originated in the 15th century. The film is directed by Kevin Reynolds, and stars Kevin Costner as Robin Hood, Morgan Freeman as Azeem, Christian Slater as Will Scarlett, Mary Elizabeth Mastrantonio as Marian, and Alan Rickman as the Sheriff of Nottingham. The screenplay was penned by Pen Densham and John Watson. The Tree of the Year competition is held in the United Kingdom in Autumn each year by the Woodland Trust, a nationwide conservation charity. Nominated trees are shortlisted by a panel of experts before going to public votes to select a tree of the year for each of the four constituent countries of the United Kingdom. The panel then selects one of these to become the British tree of the year and be nominated for the following year's European Tree of the Year. The competition has been run each year since 2014. Northumberland National Park is the northernmost national park in England. It covers an area of more than 1,050 square kilometres (410 sq mi) between the Scottish border in the north to just south of Hadrian's Wall, and it is one of the least populated and least visited of the National Parks. The park lies entirely within Northumberland, covering about a quarter of the county. Fair Head or Benmore is a 5 kilometre mountain cliff, close to the sea, at the north-eastern corner of County Antrim, Northern Ireland, whose rock face is formed into distinctive vertical columns like organ pipes. Fair Head is regarded as one of the best outdoor rock-climbing locations in Ireland, and its long cliff, up to 100 metres high in places, is considered one of the biggest expanses of climbable rock in the British Isles. The Hadrian’s Wall Path is a long distance footpath in the north of England, which became the 15th National Trail in 2003. It runs for 84 mi (135 km), from Wallsend on the east coast of England to Bowness-on-Solway on the west coast. 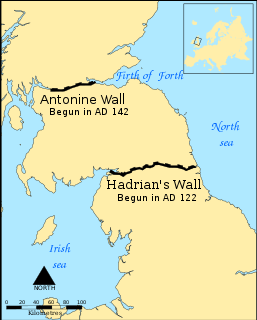 For most of its length it is close to the remains of Hadrian's Wall, the defensive wall built by the Romans on the northern border of their empire. This is now recognised as part of the "Frontiers of the Roman Empire" World Heritage Site. Greenlee Lough is a lough or lake and national nature reserve 3 miles (5 km) north of Bardon Mill, and 1.5 miles (2.4 km)north of the B6318 road in Northumberland, northern England. The Gap of Dunloe, also recorded as Bearna an Choimín, is a narrow mountain pass running north-south in County Kerry, Ireland, that separates the MacGillycuddy's Reeks mountain range in the west, from the Purple Mountain Group range in the east. It is one of Kerry's most popular tourist destinations due to its scenery. Magnae, fully Magnae Carvetiorum, was a Roman fort on Hadrian's Wall in northern Britain. Its ruins are now known as Carvoran Roman Fort and are located near Carvoran, Northumberland, in northern England. It is thought to have been sited with reference to the Stanegate Roman road, before the building of Hadrian's Wall, to which it is not physically attached. In fact the Vallum ditch unusually goes north of the fort, separating it from the Wall. Broomlee Lough is an inland lake in Northumberland, England at the southern edge of Northumberland National Park. The lough lies immediately north of the course of Hadrian's Wall. Old legends portray the lake as a repository of hidden treasure. LJ Ross is the bestselling author of the DCI Ryan series of romantic suspense thrillers. Her debut novel, Holy Island, was released in January 2015 and, by May, it had reached number one in the Amazon UK chart. Its sequel, Sycamore Gap, released in September 2015, is also a UK bestseller. She has released further books in the DCI Ryan series. Ross's sixth novel Cragside reached number one on the Amazon UK chart and she is reported to have sold over 1,000,000 copies. 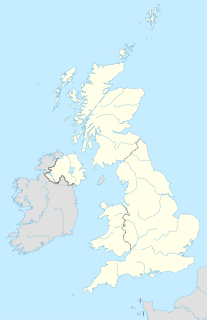 Allolee to Walltown is the name given to a Site of Special Scientific Interest (SSSI) in Northumberland, England. The site, which follows the path of a section of Hadrian's Wall, is notable for an unusually wide range of grassland types growing on thin soil above the Whin Sill, a rock formation peculiar to the Northern Pennines. 1 2 3 4 5 6 7 8 "Famous Hadrian's Wall tree wins national competition". Carisle News and Star. 31 December 2016. Retrieved 11 July 2018. 1 2 "Sycamore Gap on Hadrian's Wall is 'Tree of the Year'". ITV News. 18 December 2016. Retrieved 11 July 2018. ↑ Harley, Nicola (17 December 2016). "Robin Hood tree wins coveted Tree of the Year crown". The Telegraph. Retrieved 11 July 2018. 1 2 3 Henderson, Tony (16 February 2018). "Is Sycamore Gap the most photographed tree in the UK?". Newcastle Evening Chronicle. Retrieved 11 July 2018. 1 2 3 4 "The Sycamore Gap Tree". European Tree of the Year. Environmental Partnership Association. Retrieved 11 July 2018. 1 2 3 "Read about Sycamore Gap". National Trust. Retrieved 11 July 2018.